2017 was a good year for using productive applications that helped me get my various jobs and tasks completed. I look forward to writing and sharing some of my favorite applications and features mainly because I want to recognize the great work that developers are doing, and I also hope there are Mac users out there who might find one or two of my recommendations useful in their daily workflow. All the applications and features I chose for last year’s recommendations are still heavily used by me and other Mac users, but as I go into the new year there are a few applications that I will be trying out or using more regularly. As I explain below, some applications I chose for this year are because they solve a particular challenge in my daily workflows, and that’s basically my criteria for what makes a good application. So without further ado, here are my recommendations. I hope that you will share your recommendations in the comment section below. Earlier this year, the journal writing application, Day One received some major updates including a self-publishing feature. I was fortunate to be a beta tester for the various updates, and I got to publish two books based on collections of my journal entries. 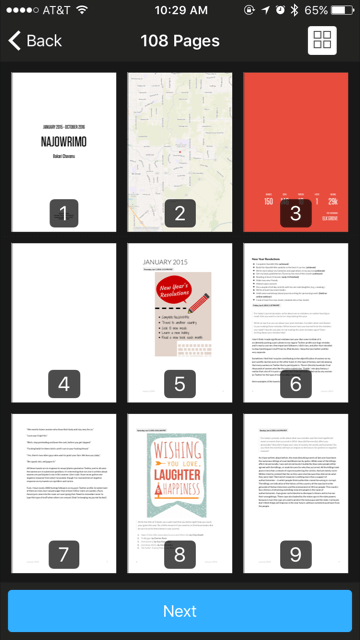 The process for selecting and laying out a book in the iOS version of Day One is relatively easy, and the quality of published books is excellent. There are many entries in my Day One journal that I will never publish, but browsing through my published journal in book format makes them more enjoyable to review and read. I have always tried to use an outline application as part of my pre-writing process and research. For a while I used OmniOutliner, but I found it too bulky to open and use. After doing lots of search, I discovered Outliney, which is a light weight outline application that I use for outlining major projects. I wrote a review of Outliney earlier this year. For the most part I have stopped buying paper books for a few reasons: One is because they are typically more expensive than the digital version, and two because it is easier to access and read the digital version of books in the Kindle Reader app that I keep updated on my iPad 2 and iPad mini. I have used the Kindle App since its inception, and each year useful features get added. 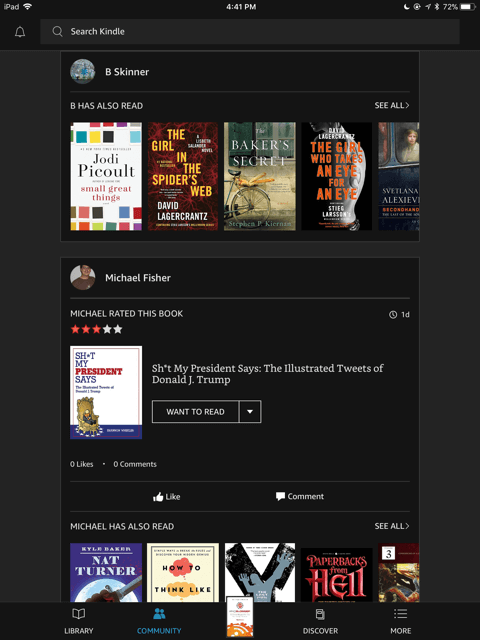 The app is now directly integrated with the book review website Goodreads, which means I can browse my Goodreads page from within the app, and well as discover other recommended books. I’ve always liked the Kindle app because it allows me to review all my color coded highlights, notes, and starred annotations. Because I read mostly non-fiction, the annotation feature is seriously useful for reviewing the contents of books. The Kindle app also allows for sharing links to selected highlights on your Twitter or Facebook pages. For a long while I used SOHO Notes mainly because it offered a floating notes feature that I used a lot for writing quick notes and outlines. But for some reason the company discontinued the feature in the new version of their notes application. After doing some searching, I found that MiniNote is the only application that I know of that includes the ability to launch the application and use it as a floating notebook. MiniNote is smaller than Apple Notes and Evernote, and that’s a good thing. I needed an application that I can quickly activate and hide using a BetterTouchTool finger gesture, and that doesn’t take up a lot of space on my Mac. Many of the notes I add to MiniNote get deleted when I no longer need them. 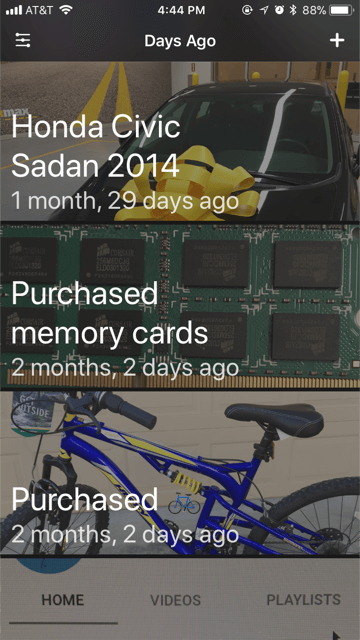 Days Ago is a handy iOS application that I use to keep track of various dates, such as how many years I’ve been married, when I purchased my latest iPhone and AirPods; when I started revising and updating my YouTube account, and other dates I want to remember. I don’t of course use Days Ago everyday, but it’s my little memory bank for when I need it. 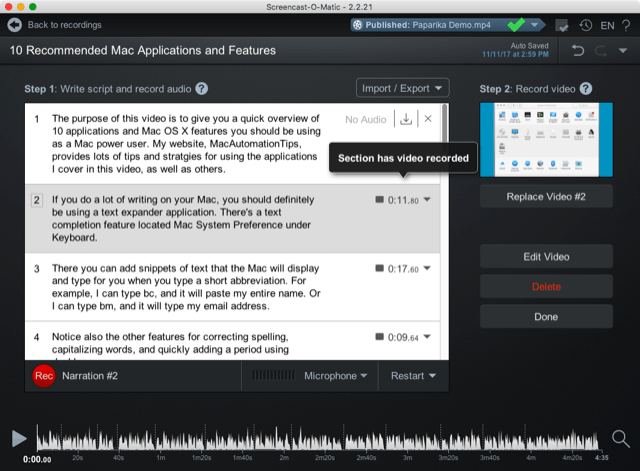 One of my favorite applications I started using this year is the desktop video recording application, Screen-o-Matic. 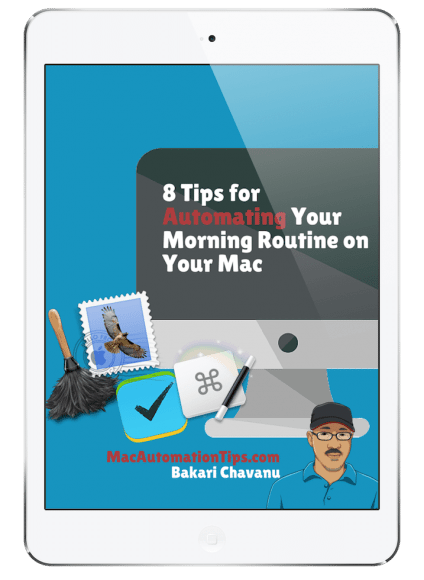 It’s the application I use to fairly quickly capture and share Mac automation tips and application reviews. 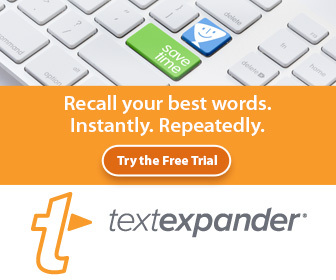 A unique feature in Screen-o-Matic is its script and narration tools. This feature allows for writing a script, reading and audio recording each section of a script in the editor, and video recording for each section based on the script. The process does take some time, but when used effectively it can make for a better narrated video. The ability to add a music track to video recordings was a very important update this year in Screen-o-Matic. Screen-o-Matic doesn’t allow for layered video clips, so I still have to use ScreenFlow for that purpose. But Screen-o-Matic is easier to access and capture recordings, and it allows for sharing video productions to YouTube, Dropbox, and other cloud services. I’ve used the cross-platform recipe application, Paprika for several years now. While I don’t always have time to cook new meals as much as I would like, when I do get the time, I can open Paprika and find recipe that I have saved there from a website. With Paprika, you can manually type and save recipes in the application, or better yet you can add the URL for where a recipe is published, and then, in many cases, Paprika will parse the ingredients and directions of the recipe, saving you the trouble of manually typing the recipe. Check out the video above to see it in action. Because there’s an iOS version of Paprika, I can easily pull up a recipe on my iPhone while at the grocery story and buy the items I need. 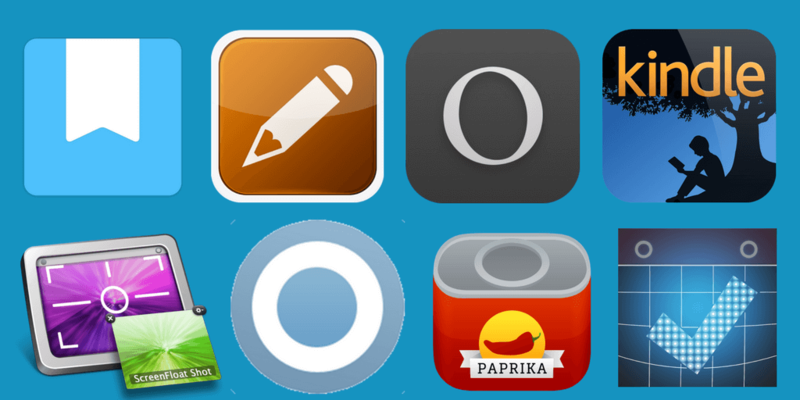 Paprika enables you to manage recipes and even create grocery lists of a selected recipes when going to the store. 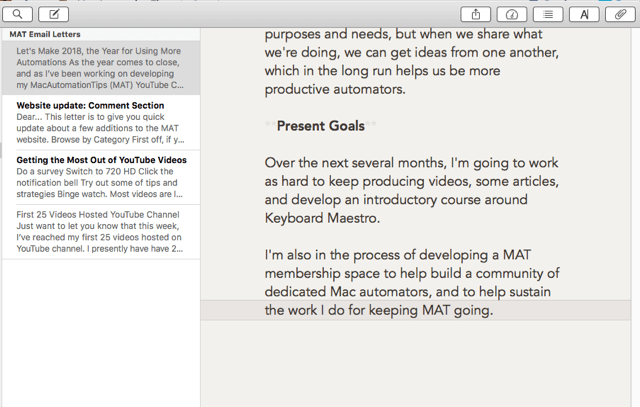 One of the things I don’t like about using text editors and notebook apps like Pages, Apple Notes, or online text editors is that I have to manually scroll a document up to keep the text I’m typing in the middle of the page. While I use a Keyboard Maestro string trigger to automatically scroll up a document I’m typing in, the text editor Ulysses includes an automatic Typewriter Mode. For those of you who might not know, with old manual typewriters the text you typed was always in the center of the page. The electric typewriters automatically scrolled up the paper as you typed. That’s what Ulysses can do. I use Screenfloat several times a day, and for the most part it has replaced the default macOS screenshot application. I can easily trigger Screenfloat with a BetterTouchTool finger gesture, and I use other gestures to close or hide shots opened on my desktop. Here’s a short video about Screenfloat if you’re not familiar with it. Ironically after successfully using the task management application Todoist for over a year and reaching the Grand Master level, I’m switching from Todoist to Informant 5. I have nothing but high praise for Todoist. 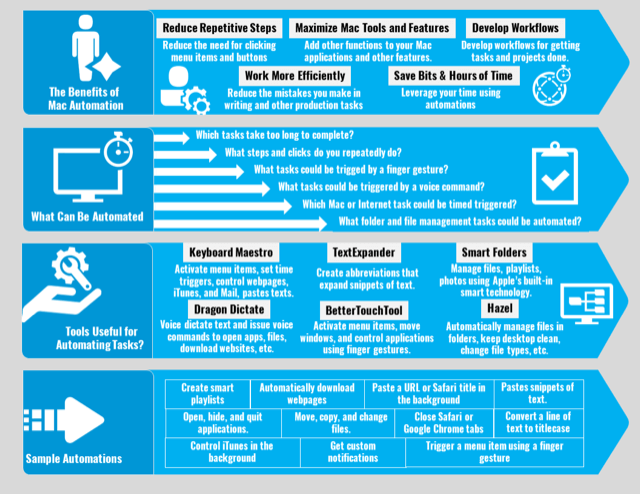 It enabled me to finally get in the routine of creating and following through on daily tasks and projects. But toward the end of the year, I discovered that I needed a spatial view of my tasks. I need to see my entire week so that I can plan which days I will do tasks, and move unfinished tasks around as the week progresses. Tasks can certainly be managed and moved around in Todoist, but the week view of tasks in Informant for Mac and iOS makes the management of tasks easier. Informant may not be as well designed as Todoist, and it doesn’t have the web version that Todoist offers, but Informant has plenty of other management features that make it more powerful than Todoist. I didn’t look forward to leaving Todoist, but after spending a week trying out Informant again, I realized I needed to make the switch. I and my readers would love to read what some of your recommendations are. Please share in the comment section below. Atically saving materials to a cloud as you upload them to iTunesU. I want to be able to share materials saved in another location so that those without iPads can still access resources outside of iTunes U.
Hi James, if I understand you correctly, could you use Hazel to copy files to your cloud folder?